Figure 2: The extra harmonic filter is ready for action in this photo. I’d used a kit for the PA output LPF in the TX box, but when I added an additional filter between the Progrock and the BS170 driver, I just put it on perf board. I also cobbled together a little coffin for the filter. using double sided copper clad board pieces, and a lot of solder. Note the solder does the most good when it’s used on the inside seams, where there is copper-to-copper contact. 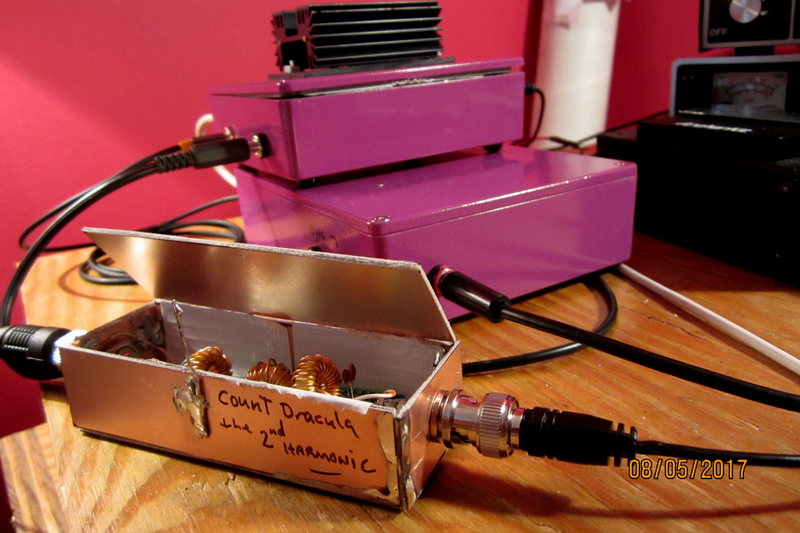 This entry was posted in Uncategorized and tagged copper clad, copper clad coffin, filter, LPF, QRP. Bookmark the permalink. I wonder if you just purchased the unit, or if it’s been in your possession. Could be something as simple as a bias adjustment, or it could be a worse thing – like a soft driver transistor or output transistor. The last time I checked, the output transistors were still available for about $80. Yeah – that’s an ouch. What kind of power supply voltage are you running on the Alda? Thanks for getting back to me. I’m a big fan of the Alda 103 transceiver and thankful that you had posted information about it on your website. I couldn’t really find a lot of information about the radio on line and I’m thinking it has to do with the production run of the radio – about two years from what I understand. Mine was an Ebay special I had purchased a while ago. My Alda 103 didn’t have the side tone, but after visiting your website, I was able to fix that and now my unit works on CW. My RX now works on all bands. When I first got my Alda, it wouldn’t work on 80 meters RX. Later, I found out that one of the 80 meter diodes on PC301 was burned out and after replacing it the RX worked! I am not a technician and this is just a hobby for me. I also have an Atlas 210X which I would think would have been a rival of the Alda 103 as they are both solid state. In my opinion, I think the Alda 103 is a much better radio. I’m using an Astron power supply to power up the Alda – should be more than enough to operate it. I’m assuming this is just a 100 watt radio, am I correct? My Alda will come close to 100 watts on 80 meters, but drops off on the other two bands. Looking at the manual, I had already replaced Q301 & Q302 from PC301 and had improvement. Are there areas on the Alda 103 where I should be looking to increase TX output? You mentioned the bias adjustment. My RX is fine. I would like to get the other two band closer to 100 watts if possible. I’m limited in equipment, but I can solder and trouble shoot when needed. Any information or suggestions would be greatly appreciated! Like you, I’m just a hobbyist. It’s been awhile since I last looked at the Alda schematic. I think the transistors you replaced are for the TX amp, so that’s OK. You say power is down on 40 and 20, so that speaks to the 40/20 oscillators maybe? There are some tunable circuits in there, but I think those shouldn’t have changed much. There is no extra oscillator on 80 meters, so that’s something that is different in the way the 40/20 bands work versus the 80 meter band. Also, some components will just be more efficient at 80 meters. The Alda was built to run a pretty wide range of power voltages, which is why I asked about the PS voltage you were using. I think it’s because the designer was a mariner, and he wanted it to be flexible. So, the manual says you can put up to 16V DC on it. I really don’t do that, because I think some of the capacitors are rated a little too close for comfort. But, once I did, just to see what would happen with the power. At 16V DC, my Alda was putting out 150 watts on 80 meters, but only 135 watts on 40 meters. At 11V DC, the power dropped to about 40 watts, and the oscillators got to be a little unstable. So, I think there’s just some higher frequency inefficiencies at work for those numbers to happen. You didn’t say how much different the power output levels were. As I wrote, just a hobbyist like yourself here – so take with grain of salt.